Very little is blooming in Mother Nature’s Gardens right now. But the recent rains have coaxed a number of annual wildflower seeds to germinate. We’ve chosen one of these, the Bicolor or Miniature lupine, as our Plant of the Month. 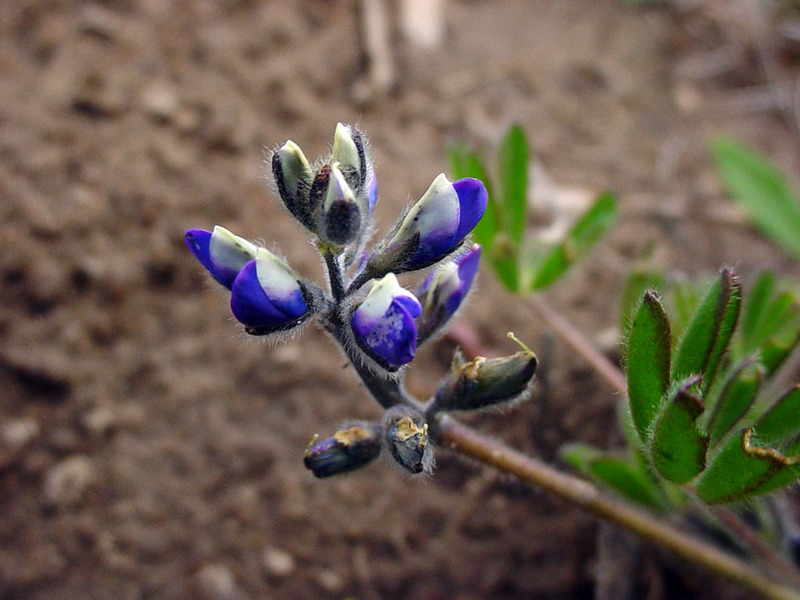 Like many native species, Lupinus bicolor is the subject of current taxonomic debate. 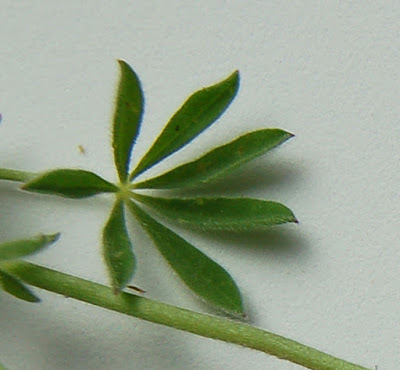 The species shows morphologic variability within its range, and variants have been categorized as several separate species, as well as varieties and subspecies of Lupinus bicolor. For simplicity, we’ll just discuss the species as a whole. Former species which now are included in Lupinus bicolor are: Lupinus congdonii; Lupinus polycarpus; Lupinus rostratus; Lupinus sabulosus; Lupinus umbellatus and possibly others. The geographic range of Bicolor lupine stretches from British Columbia, Canada to Baja California, Mexico. The species grows throughout the California Floristic Province (West of the Sierras) and in the western Mojave Desert. In Western Los Angeles County, it can be found in the Santa Monica Mountains, on the Southern Channel Islands and in the Los Angeles Basin from the Transverse Ranges to the Pacific Ocean. 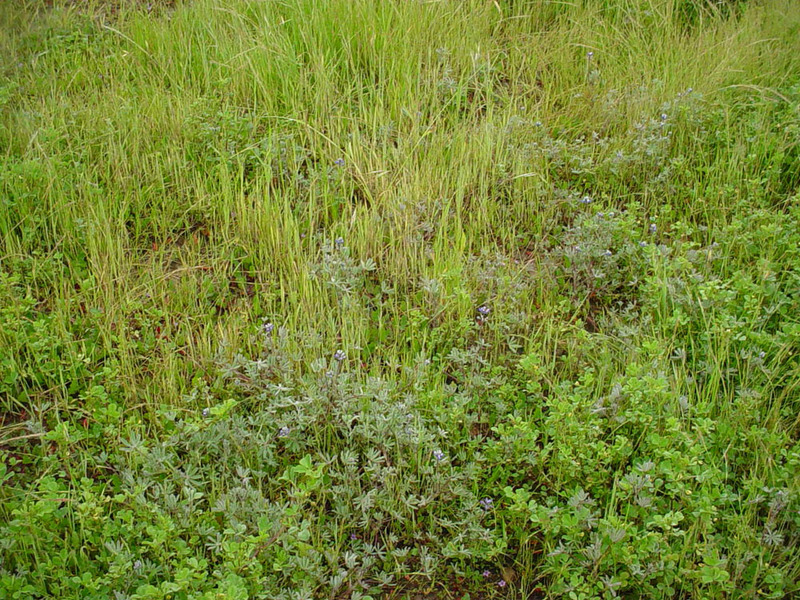 It is a common in open or disturbed areas from sea level to about 5000 ft. (1500 m.). Like many annual wildflowers, it can be found in a number of California plant communities including the coastal strand, southern coastal prairie, valley grasslands, joshua tree woodland, yellow pine and mixed evergreen forest, and foothill woodland communities. 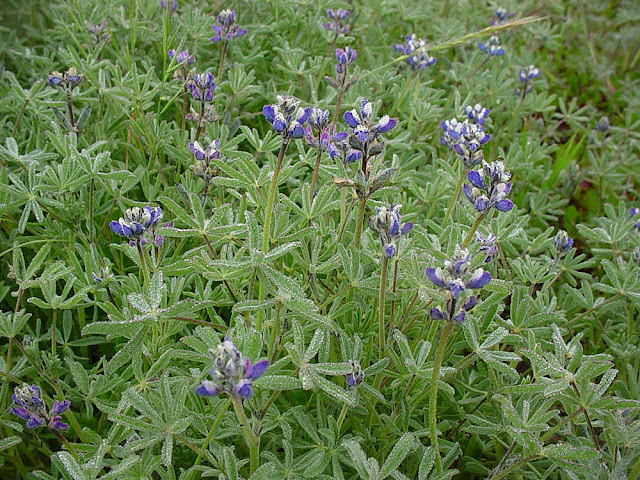 Bicolor lupine is one of about 75 species of Lupine native to California. About one-third of them – including Lupinus bicolor – are annuals; the rest are perennials, sub-shrubs and shrubs. All are members of the Pea Family, the Fabaceae. 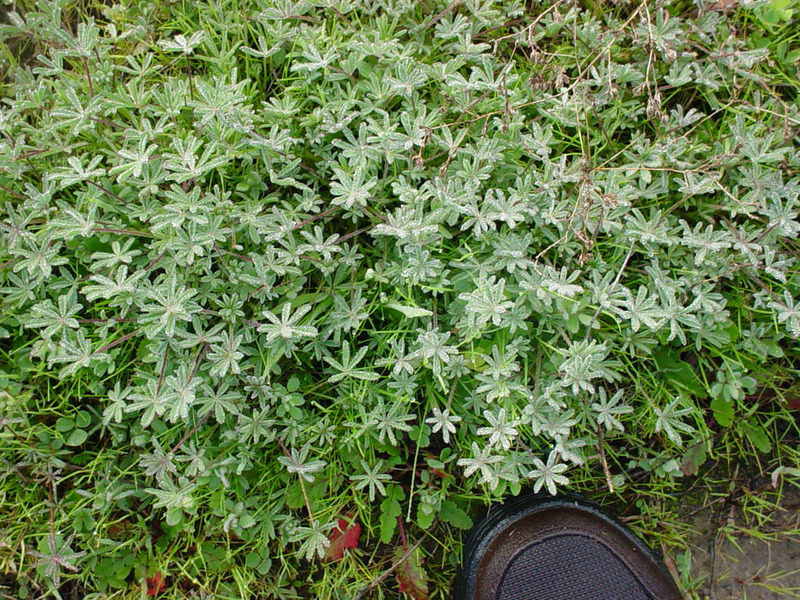 Like many in this family, Lupines have a unique relationship with special soil bacteria. These bacteria live within nodules in the roots and convert nitrogen to a form that can be used by plants, through a process known as nitrogen fixation. When the root dies, the converted nitrogen is released into the soil, improving soil fertility. 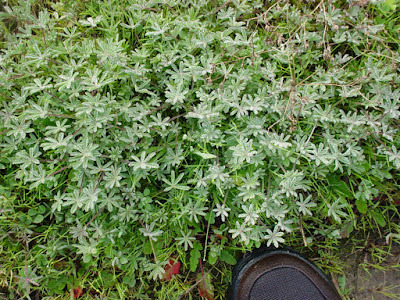 Bicolor lupine is a small annual, usually less than one foot tall locally, with medium- to gray-green foliage clustered at the base of the plant. The palmately compound leaves, which look like an open hand, have 5 to 7 leaflets and are covered in short, transparent hairs. The leaf shape is typical for Lupines. As can be seen in the photograph above, the hairs trap mist and fog quite effectively. The flowers of Lupinus bicolor are petite and charming, making them a favorite small wildflower. This is a fairly early bloomer – often February or March in Western Los Angeles County, later in colder climates. The flowers, which are usually less than ½ inch across (1/4 to 1 inch; < 2.5 cm.) are arranged in a spiral pattern (whorl) around short flowering stalks. The flowering stalks, often not much taller than the foliage, usually have 4-10 flowers per stalk (see above). 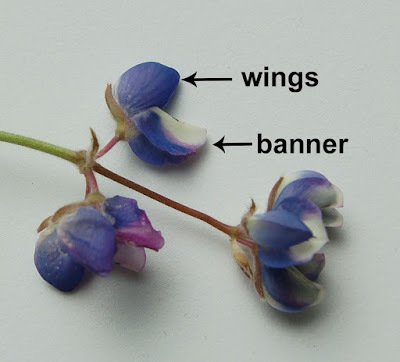 The individual flowers have a shape typical for the Pea Family, with petals modified into a ‘banner’, well-defined ‘wings’ and ‘keel’ (mostly hidden). The flowers are two-toned: the banner is white with blue-purple spots or blotches, while the wings are blue-purple. Like other local lupines, the flower color changes from blue-purple to red-purple after a flower is pollinated, sending a cue to insect pollinators that no more nectar is being produced (see photo, above). 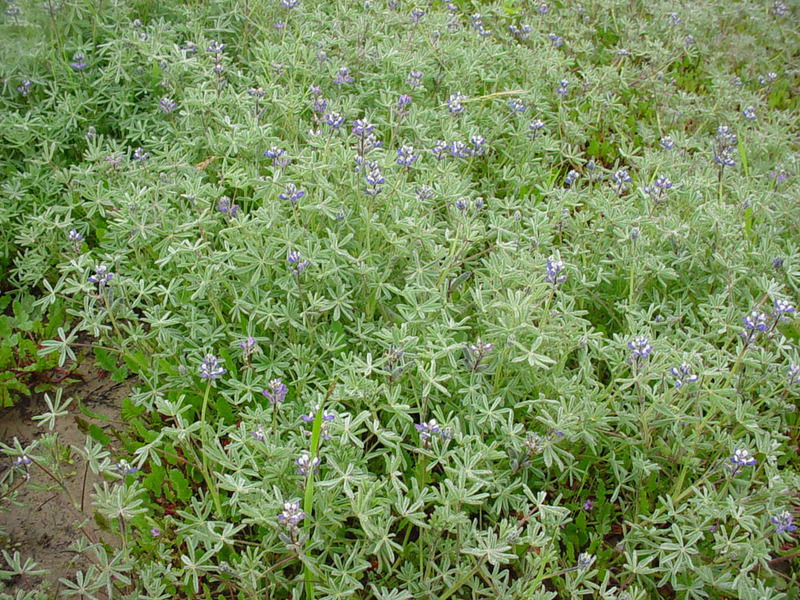 Miniature lupine is insect pollinated, primarily by bees. The insect lands on the wing petals, causing them to move and reveal the sexual organs located in the keel. The pollinating insect brushes against the stamens and stigma while retrieving nectar, thereby pollinating the flower. The seeds develop in small ‘pea pods’ that burst open explosively when dry (mid- to late-Spring), spreading the seeds. Bicolor lupine is fairly easy to grow from seed. Like all lupines, the seeds have a hard seed coat; germination is enhanced by soaking them in hot tap water overnight before planting. 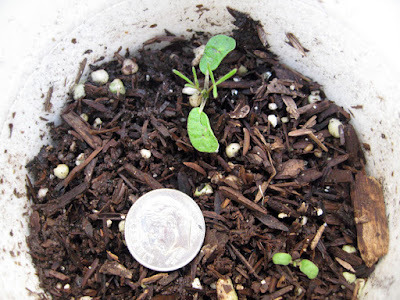 Seeds can then be planted in prepared seed beds or in pots for later transplanting. Lupines tend to have long roots – in our area they are often easier to seed directly into the garden rather than transplant. Be sure to plant seeds on bare ground or under a thin gravel mulch. Plant just before a good rainstorm in late fall or winter, then rake in lightly; seedlings will appear in several weeks. Lupines are an excellent source of nectar for bees, particularly the larger, early-flying species. The foliage is a larval food source for Orange Sulphur (Colias eurytheme) and several species of Blue butterflies. The seeds, which are toxic if eaten in large quantities, are eaten by ground-foraging birds, particularly Doves. They are an important food from summer through fall. In summary, Lupinus bicolor is an annual wildflower that does well in California gardens and wildlands. It likes sun, but is not particular about soil type. If winter rains are adequate, Bicolor lupine needs no supplemental water, completing its life cycle before the summer dry season. We like to use Lupinus bicolor along pathways or in containers, where its small size can be adequately appreciated. It is often grown, as in nature, with other local annual wildflowers, California poppies and cool season native grasses. 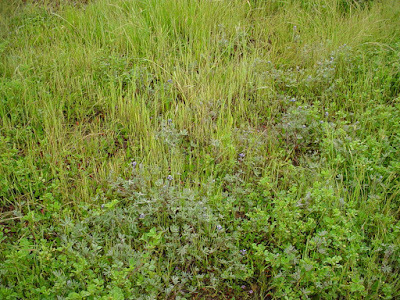 It is a charming seasonal groundcover on banks and around rain gardens and infiltration swales. A mass of Bicolor lupine, blooming in spring, is a sight for sore eyes. If happy, it will re-seed in local gardens, returning whenever we have a rainy winter. Lupinus bicolor is part of our unique natural heritage and a welcome reminder of the climate cycles that so characterize S. California.